A group of students spent just over a year doing all sorts of different fundraising activities for the trip. The activities ranged from ghost walks and bag packs to raffles and cake sales. The successful students chose to do a combination of care and conservation work on their trip. They met up with Luis Arguedas the Costa Rica director at the academy to discuss the programme a few months before they left for Costa Rica. They arrived in San Jose before travelling to Diria for the hard work in the jungle before joining their care project in Heredia. "As an entrepreneurial academy we wanted to design an experience that would help the students develop and test their skills, not only on the trip but in the planning as well. With the help of fellow students they have been raising funds to support the trip and also each taking responsibility for an aspect of the visit that will help us as a team get the most from the experience and help those we are working with the most." The group joined a conservation project working in Diria National park in their first week before going to work in a care centre on the edge of Heredia in their second weeks doing a mix of painting work alongside helping with activities with the local children. "Outside the simple netted dormitory and communal spaces, you can hear the constant sound of insects, birds and running water. It is magical. We have arrived in butterfly high season, so we keep seeing large butterflies drifting like puppets on the mangoes rotting in the short grass outside. We are going to be bitten lavishly while we are here. It is incredibly humid. The air is rich with cicadas. We have been given instructions about calling the rangers when we see snakes and large insects in our dormitories…. but are reassured that most of the tree dwelling snakes that live in the roofs of the dormitory blocks are harmless. We think they were joking. Oscar, Ms Durham and I sit outside listening to Spectacled Owls making happy 'boop' noises, and watching bats scooping up insects attracted by the compound lights. Our job today is to trek back up to that trail and place time-delay cameras along the trail to see if we can capture ocelots on film. We will probably have to go back during the week to check the batteries too. We set off at 8am. We have no electricity, and are briefed that the water pump is also not working, so have to ration our water. We will 'shower' in the river until the power is back on. We all agree this sounds fun anyway, and head off for the morning. When we reach the viewpoint, high up in the canopy, we can see for miles through the haze – ancient volcanoes dusted with trees, other peaks around us. It is really beautiful. For a moment the sun breaks through the cloud – and the temperature soars. We reluctantly head back down to join Ms D, who has stayed with JoseMario, nickname Macho (which means 'blondie' in Costa Rican Spanish) as she is really feeling the heat. 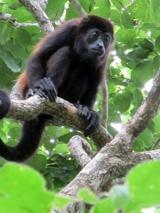 While we are away she witnesses a major fight between howler monkeys and captures the whole thing on film. We worked with Oscar and Josemario to clear a 3 km trail near the compound, raking leaves and clearing the undergrowth that our two guides hacked back with their machetes. We worked really hard." This is just a taster of some of the work done during the first week by the group. On the Saturday the group got up early to go zip lining in one of Costa Rica's famous national parks near to volcanoes and natural springs. They then spent some time relaxing in the local mud baths and natural springs. The group then travelled down to Heredia on the edge of the capital San Jose. They had some time to mix with local families in the parks and then go and visit the local coffee plantation. "We headed off towards Heredia to start work on a new mural to decorate the front of a nursery and junior school, which also looks after children from deprived backgrounds. We are combining their logo with wildlife – including some of the animals we saw last week like the Julia and Morpho butterflies. We are working with a renowned Costa Rican artist called Jilberto, who Sharon hit it off with immediately despite the language barrier. 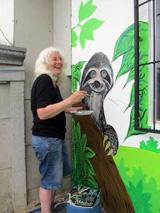 She was drawing sloths for him within half an hour of meeting – and he said they were perfect! We had to finish off whitewashing the wall before starting work on the design – and had a few technical difficulties with ladders, paint and trying to fit under the roof of the school once it starting raining….we will be back tomorrow. Having spent the morning working with the children there are many hugs with the children as we leave. We head on to do as much work as possible on our mural and have to admit that we cannot finish it at about 4pm. The artist who has worked with us will continue it, and send us completed photos when it is done. Sharon's sloth is agreed to be a masterpiece…Freddie and Bush's butterflies pretty damn good too. Honor's ladybird will no doubt look better when it has legs. And spots. Vera's toucan is very authentic. Freddie, our guide, is very kind about our work this week – 'I wish all groups were like you' were his actual words – and we are hoping that he will join us for our final dinner tonight up in the hills above Heredia and. San Jose. We ended our work day by sitting together and reflecting on our time here, capturing a few of our thoughts on video (as the skies open for the first time since we arrived in Heredia). We are hoping to share all of this, and our diary, when we get home. For now – it is time to pack, share a final happy evening together – and then come home. Then we will have more time to reflect on how this remarkable experience might have an impact on our futures. Thank you Costa Rica. Pura Vida, as they say here." Thank you to Honor and the group for their blog they wrote through the trip. "The trip to Costa Rica has made me more aware of the deprived areas and challenges people around the world face. It has made me think I definitely want to do more volunteer work to help people that are less fortunate than myself."